Jewish convert of Montpellier, France; contemporary of NaḤmanides. After having been baptized, Christiani joined the Order of the Dominicans and attempted to convert his former coreligionists. Failing to make proselytes among the Jews of Provence, to whom he had been sent by his zealous general, Raymond de Penyaforte, Christiani planned the conversion by force of the Aragonian Jews. To this purpose he persuaded Raymond de Penyaforte to bring about a religious controversy between him and Naḥmanides, in which he felt assured of victory. Raymond de Penyaforte secured the consent of King James; and Naḥmanides was summoned to Barcelona, in 1263, to answer Christiani's questions. The disputation took place in the king's palace, in the presence of the whole court and many ecclesiastical dignitaries, and lasted four days (July 20-24). As suggested by Naḥmanides, the subjects of discussion were three: (1) whether the Messiah had appeared; (2) whether the Messiah announced by the Prophets was to be considered as a god, or as a man born of human parents; and (3) whether the Jews or the Christians were in possession of the true faith. 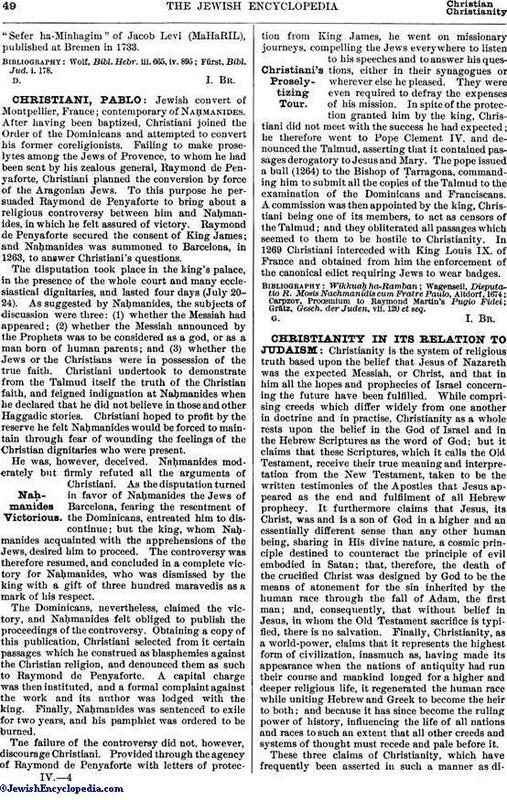 Christiani undertook to demonstrate from the Talmud itself the truth of the Christian faith, and feigned indignation at Naḥmanides when he declared that he did not believe in those and other Haggadic stories. Christiani hoped to profit by the reserve he felt Naḥmanides would be forced to maintain through fear of wounding the feelings of the Christian dignitaries who were present. He was, however, deceived. Naḥmanides moderately but firmly refuted all the arguments of Christiani. As the disputation turned in favor of Naḥmanides the Jews of Barcelona, fearing the resentment of the Dominicans, entreated him to discontinue; but the king, whom Naḥmanides acquainted with the apprehensions of the Jews, desired him to proceed. The controversy was therefore resumed, and concluded in a complete victory for Naḥmanides, who was dismissed by the king with a gift of three hundred maravedis as a mark of his respect. The Dominicans, nevertheless, claimed the victory, and Naḥmanides felt obliged to publish the proceedings of the controversy. Obtaining a copy of this publication, Christiani selected from it certain passages which he construed as blasphemies against the Christian religion, and denounced them as such to Raymond de Penyaforte. A capital charge was then instituted, and a formal complaint against the work and its author was lodged with the king. Finally, Naḥmanides was sentenced to exile for two years, and his pamphlet was ordered to be burned. The failure of the controversy did not, however, discourage Christiani. Provided through the agency of Raymond de Penyaforte with letters of protection from King James, he went on missionary journeys, compelling the Jews everywhere to listen to his speeches and to answer his questions, either in their synagogues or wherever else he pleased. They were even required to defray the expenses of his mission. In spite of the protection granted him by the king, Christiani did not meet with the success he had expected; he therefore went to Pope Clement IV. and denounced the Talmud, asserting that it contained passages derogatory to Jesus and Mary. The pope issued a bull (1264) to the Bishop of Ṭarragona, commanding him to submit all the copies of the Talmud to the examination of the Dominicans and Franciscans. A commission was then appointed by the king, Christiani being one of its members, to act as censors of the Talmud; and they obliterated all passages which seemed to them to be hostile to Christianity. In 1269 Christiani interceded with King Louis IX. of France and obtained from him the enforcement of the canonical edict requiring Jews to wear badges. Grätz, Gesch. der Juden, vii. 120et seq.